Let's start the tour today at the front door, on the covered patio. There were early spring changes to my Adirondack chairs this year. Besides new seat cushions from Menards, my chairs were given an authentically chippy white finish with Fusion Mineral Paint. I also painted the sewing machine drawers on the Red Wing crock table. Lastly, I painted a thrift shop iron table, added it to the center of a small flower garden, and set a bucket of geraniums on top to add vertical interest to a small garden. I saved this pedestal from a friend's burn pile and added it to a galvanized laundry tub. I was pleasantly surprised to find this rusty spring wreath made by my sister in law, Kris, one day after work. Morning sun on my potting sink and 2015 garage sale weathered gray bistro set, purchased from my neighbor. A very full galvanized bucket of Calibrachoa hangs from my homemade welded clothes rack purchased while junking! A crystal prism in a teardrop shape was one of the items I purchased with birthday money. I had seen this idea on Pinterest. Returning from last summer, are my iron shoe lasts on stepping stones. I hung a white metal star on my rusty gate on the front of the house. I love beautiful flowers in junky containers. These are double impatiens. My front yard border early this morning. More of the front yard border. Some of the taller perennials are still not in full bloom. So I will probably share the front border one more time yet this year. One of my favorites on the ladder this summer is annual phlox. They are getting harder to find locally. I usually wait until the lilies are in full bloom to have my garden tour. I love these giant pink Asiatics. This morning the rising sun casts a yellowish glow on the blue spruce trees behind the border. To see what I planted in my 2015 rustic wheelbarrow containers, click here. My wheelbarrow, and a weathered wooden stool with a bucket of zinnias and lantana. My gas can and fuchsia area. The recent heat has cut back on the fuchsias earlier profuse blooming. This old tree house ladder makes a perfect plant holder. Here is used tea kettles and coffee pots. To make them more secure, I have a large nail pounded through the rung from the bottom that lines up with a drainage hole on the bottom of the kettles. This is from the deck side of the house looking to the front flower border. I bought this rusty section of fence on one of my junk hunts, and the "Grow" sign is from the Tattered Angel, a local occasional shop. My old bike is back to white. Rustoleum "Heirloom White" to be exact. Fuchsias and creeping jenny are planted in a pot in the basket. This is one of my "double decker" barrel planters. I add a galvanized bucket to the center of the barrel to add height and vertical interest. This one has double and single impatiens in shades of pink and a small fuchsia in the same shades. This shady bed under a tree by our deck is planted with impatiens, hosta and on the sunnier side, sedum. Continuing along the deck, I planted red geraniums, pansies, and alyssum. Rusty wheels and my "grow" shovel from last year are leaning up against the deck. I like using some of the old fashioned annuals. At the side of the deck, looking at the front yard. This chair leg repurposed sign hanger I made in 2014 continues to be a popular idea on Pinterest. A galvanized tool box hangs by its handle on a hook under the deck railing and holds two types of petunias and a yellow two tone calibrachoa. Lush white alyssum, sedums, and sempervivums in and around the old typewriter. A bench on the deck with buckets of red nemesia, lobelia, yellow lantana and blue bacopa. A black eyed Susan vine is in the center pail. One of my most pinned projects, the framed lobelia, returns but hanging on the deck railing and not from a tree. In Let's Kick Off Junk Gardening, I made this funnel, bedspring, and weathered wood planter for hen and chicks. I think they look like garden sno-cones. This barrel of red impatiens is growing so tall, that the double-decker planter of lobelia is almost hidden from this angle. In an earlier post this summer, I added a birdhouse to to top of an old garden fork and displayed it with other rustic birdhouses on another of the deck's railings. My picket fence was moved to the side of the house. The rock and metal rooster was purchased with my Mother's Day cash. This is the area just past the deck and picket fence. Mostly hostas. My weathered wood terracotta pot holder holds three pots of coleus this year. My old barn door is here decorated with old enamelware lids. Here my birthday money gears and green screen door are part of a back yard vignette. An angel wing begonia is planted in a bucket on the chair. More of the back yard wall with globe thistle, white phlox and clematis. And last but not least a back yard bed of creeping phlox, sedums, alyssum, vinca, sea thrift, annual baby's breath and maiden pinks that are done blooming, for the most part. I purchased the shutter angel last year at the Tatted Angel and the "fence" is the back of an old futon! I love your garden! I would love to just walk through it & enjoy every plant. Love all this! I'm following you now!! I enjoyed the tour very much!!!! 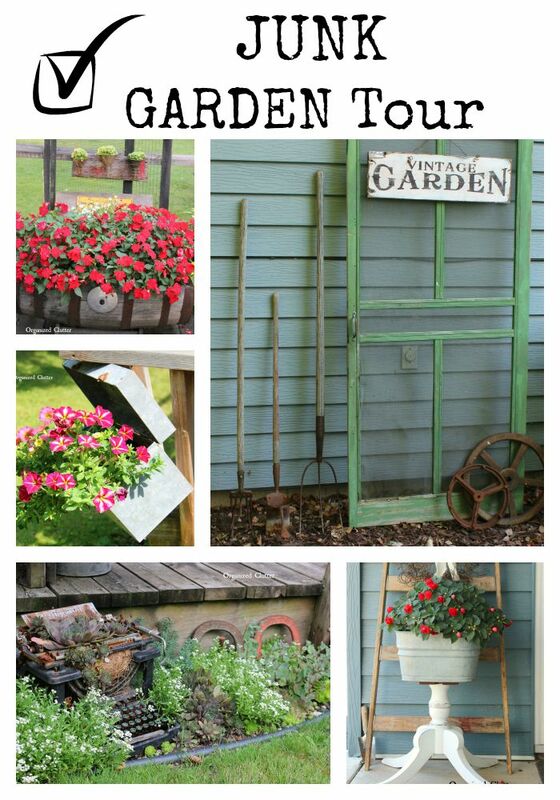 I love your garden tour! I hate that I've gotten rid of some things you might enjoy! You have a lot of work in your gardens but it looks like you keep up with it much better than I do! Keep gardenin' and keep junkin'!!! georgeous, beautiful, fabulous! What else can I say besides thanks for sharing! Love it all! You have to be the envy of the neighborhood! Wow, what a fabulous garden you've created. I love it all!! Beautiful!!! Thank you for the great tour...your garden is simply stunning! This is my favorite post of the year! You have so many beautiful plants. Do you have any hints on how to keep your annual flower budget under control? Truly artful! Thanks so much for sharing. Just beautiful Carlene ... you DO have a green thumb. Love everything and so artistically displayed. Clever display of the old bed springs and funnels. Your garden is amazing Carlene. So much great junk mixed in with the gorgeous flowers. Love it all, but I especially love the garden snow cones and the type writer. So much fun! Your garden is beautiful and exciting, Carlene. There is so much to look at and so many wonderful repurposed junk creations. Thanks for the tour. I loved every bit of it. You have such wonderful gardens, Carlene...so colorful and pretty...and such great junk, too! I loved the tour! Oh Carlene - it's spectacular ! I saw your feature at Funky Junk and knew it was yours before I even read it - LOVE the iron shoes on the stepping stones - it's just brilliant ! I want to wander through your gardens. I love and collect the very same kinds of things. I wish we were neighbors. 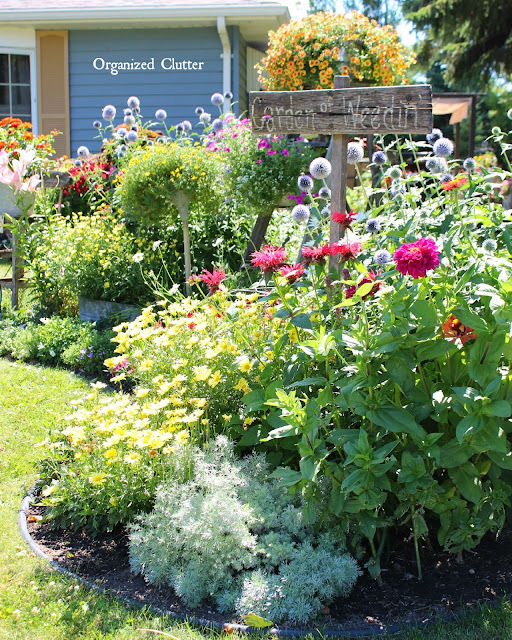 Your garden tour was spectacular, Carlene! I'm struggling to get grass seed to sprout this year. WOW! Now THIS is my kind of garden. I have so many of the same items, but my flowers aren't as pretty. Beautiful, I love it. Such fun! Love your ideas, they get my creative juices flowing. Thanks for sharing! Your yard is masterfully done! I love everything about it! Makes me want to get out and spruce my yard up! (Even in the heat!) pinned the whole tour so I can come back for inspiration. Thank you for sharing! You have creative ideas to transform old or useless things into beautiful decoration. Instead of throwing them, you managed to reuse them. I love how you used the old typewriter as a pot. Being from Wisconsin, I'm thinking of all the time it takes me to put all the yard decorations I have out in my storage shed for winter. Are you able to leave all these things out year-round? Gorgeous!!! This is my first visit to your blog, but it sure won't be my last! I just ran across your blog, I am green with envy! What a beautiful yard you have. The garden transformation you did with your rubbish stuff is just unexplainable. You made a perfect design for your yard and I admire your creativity. I wish I saved some of the stuff when I had my house cleaned yesterday. Thank you, I will know for the next time.